Filipino food has been making waves around the world the past few years. Adobo is no longer the dish nobody recognises and because of the dispersion of so many Filipinos abroad, it was only a matter of time before the rest of the world started appreciating the wonders of sisig and lechon. 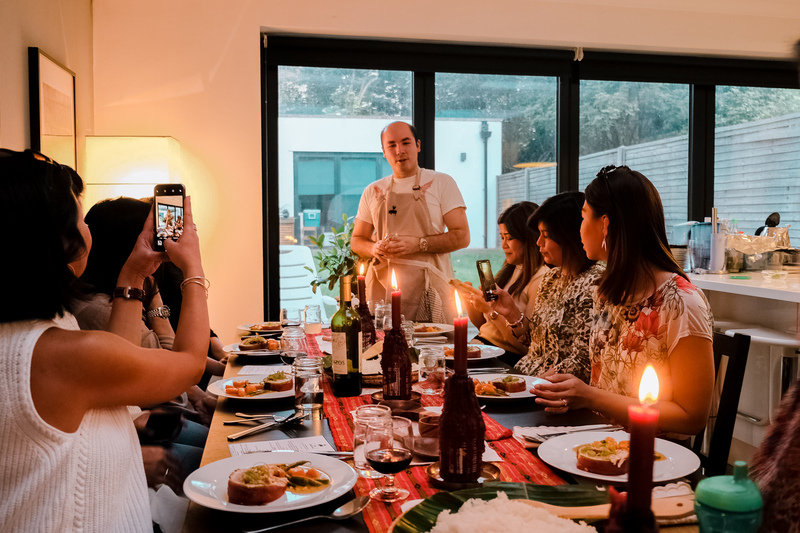 UK is home to some 200,000 Filipinos, all of whom are probably pretty homesick for home-cooked Filipino feasts, including me. Although most Filipino dishes are easy to cook at home, they still take a lot of time (my adobo stays on the stove for 2 hours minimum) and if you want a variety of food on the table (because Filipinos can’t have a meal with just one viand on the table), you’ll end up slaving away in your kitchen for hours. 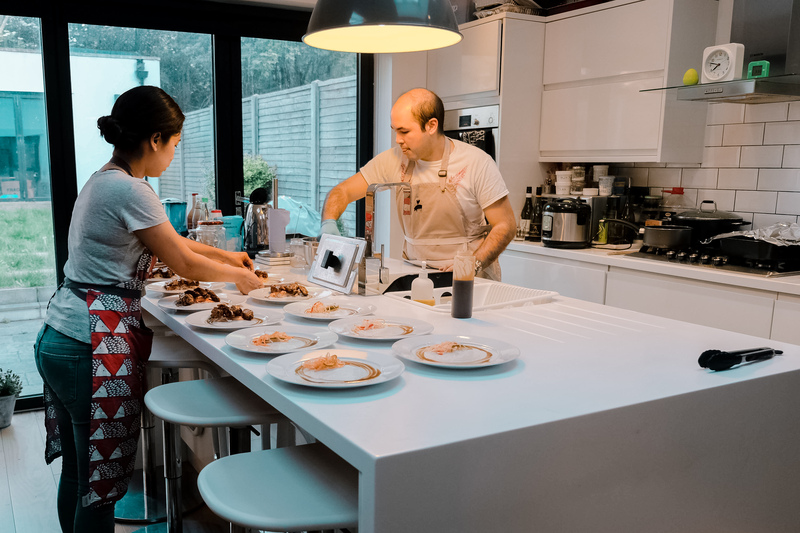 Unlike in New York, there is still a dearth of good Filipino restaurants in London. 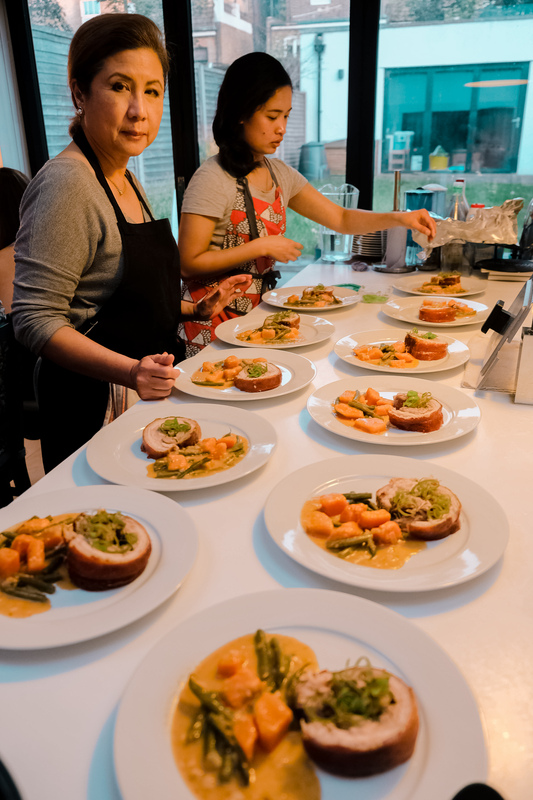 And somehow, eating Filipino food in a restaurant takes away a large element of how Filipino food is supposed to be enjoyed – casually, at home, with friends and family around a large table. Enter The Adobros. The Adobros was set up by two “bros” (actual brothers), brought up by a Filipino mom (who we met during dinner!) in Hong Kong, Singapore and the UK. We only met Mark (one half of Adobros) because his brother was traveling and planning his wedding. Mark is a banker by trade and runs Adobros on weekends. During the dinner, his fiancé and mom helped out and we got to chat with them too! 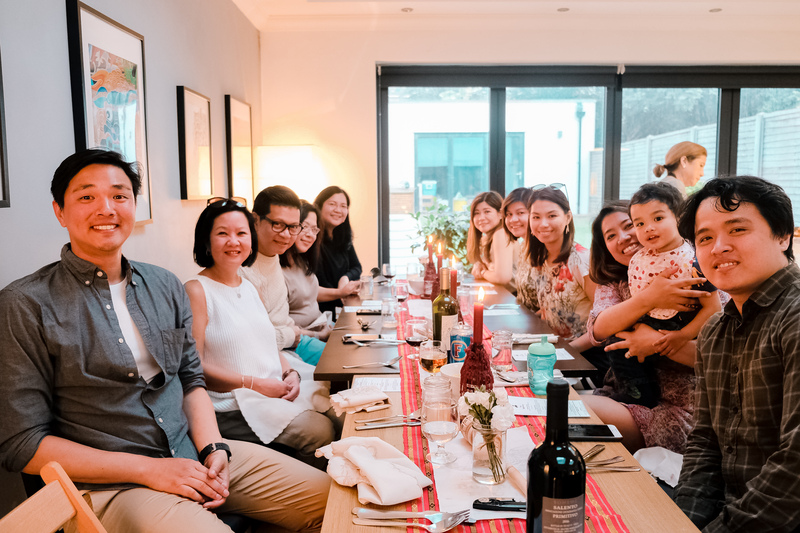 Our dinner was organised by a Filipino friend who invited a bunch of people she knew. Because she was able to pull together a big enough group, we were given a private dinner. The atmosphere was relaxed and very much just a really fun dinner party at someone’s home. Adobros offer a tasting menu at £34 per head, which I thought was very reasonable for a 3 course meal. The portions were quite generous and by the end of the night, I couldn’t eat another bite. We were also advised to bring our own bottles of wine and beer, which was great. We arrived at Mark’s house at New Cross at around 6pm. It’s a lovely flat, simply and tastefully decorated with a real homey vibe. Mark’s place had an open plan, so we were able to watch him prepare the dishes while we all chatted around the kitchen and the living area. We were offered cocktails by his mom when we arrived and after some more (lively) chit chat, we all headed to the table, awaiting the amazing feast that was about to come. Adobo is a classic Filipino dish of either pork or chicken cooked in soy sauce, vinegar and sugar. 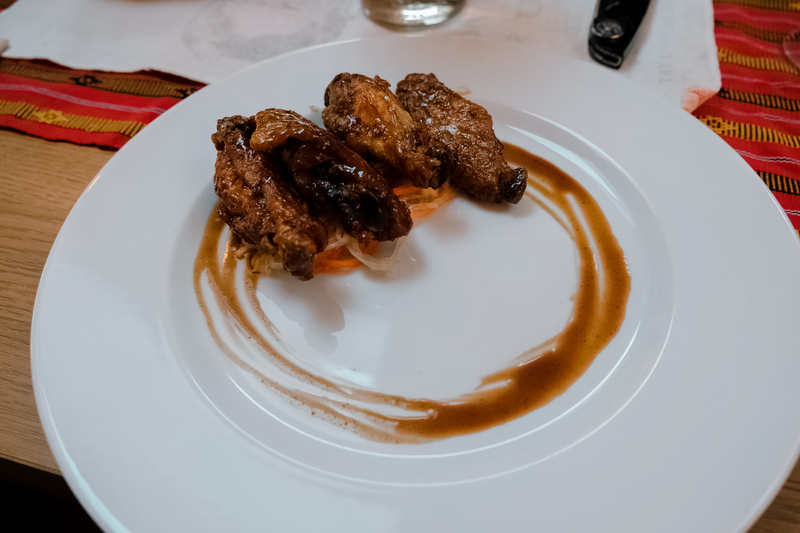 The Adobros’ version of crispy fried adobo-flavoured chicken wings was a perfect mix of sweet and salty with a crunchy-chewy exterior that I love in wings. It had a Korean influence to it and reminded me of Bonchon wings – but better! 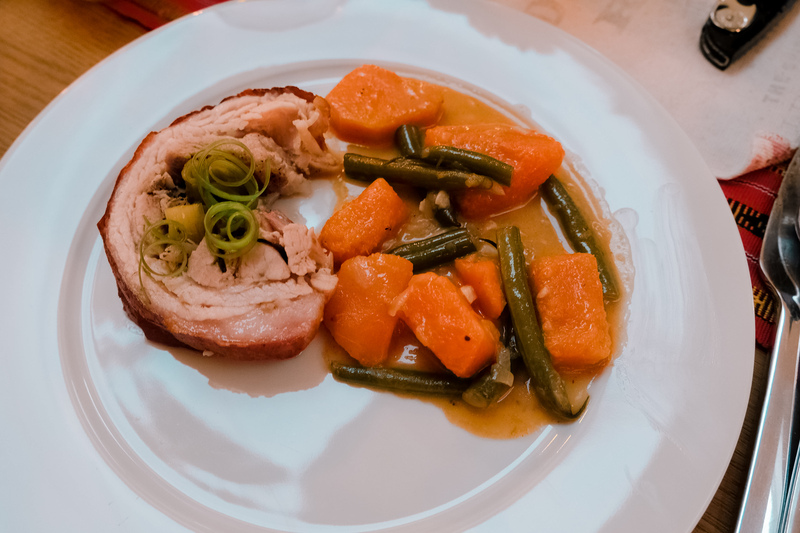 The lechon was made complete by the beans and squash served with it. The creaminess of the squash and coconut milk and crunchiness of the beans, with the pork and rice – made the perfect spoonful and brought me back straight home to Manila (I could almost feel the hot air from an electric fan while eating lunch during a scorching afternoon). Calamansi is a Filipino lime that I personally miss so much. There’s nothing like ice-cold calamansi juice on a hot day. 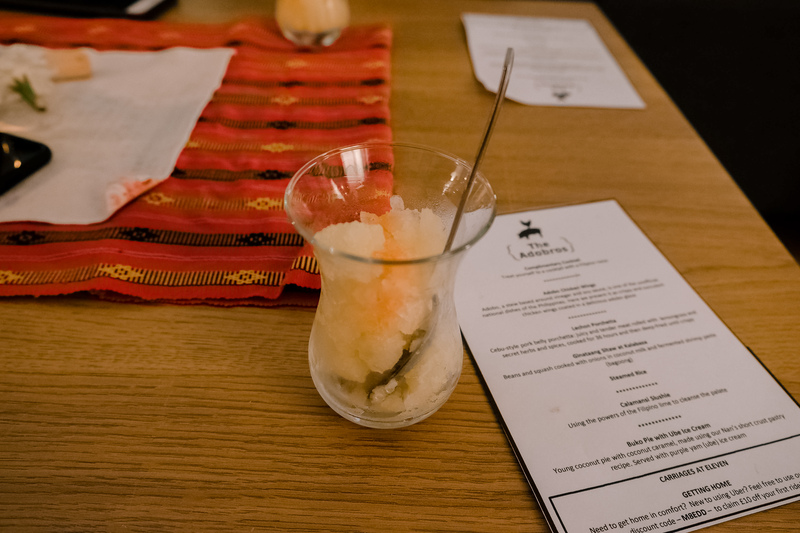 Adobros makes it into a slushie that’s a perfect palate cleanser. The dessert didn’t disappoint. The fact that it had homemade ube ice cream made it impossible to. 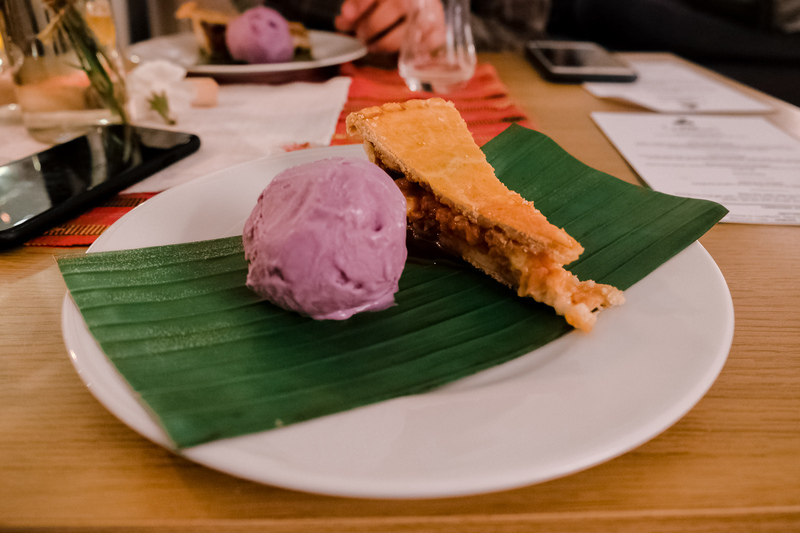 The buko tart was made with coconut caramel, which is not typically Filipino but really brought the dish to another creaminess level. It was a perfect ending to an amazing meal. Although The Adobros put their own little spins on each of the dishes, I like that they didn’t go too crazy with their ideas. Everything still tasted like home, but better. I can’t wait to be back! Our rating: 5 of 5. If you want a fun night filled with scrumptious, filling food, check out The Adobros.